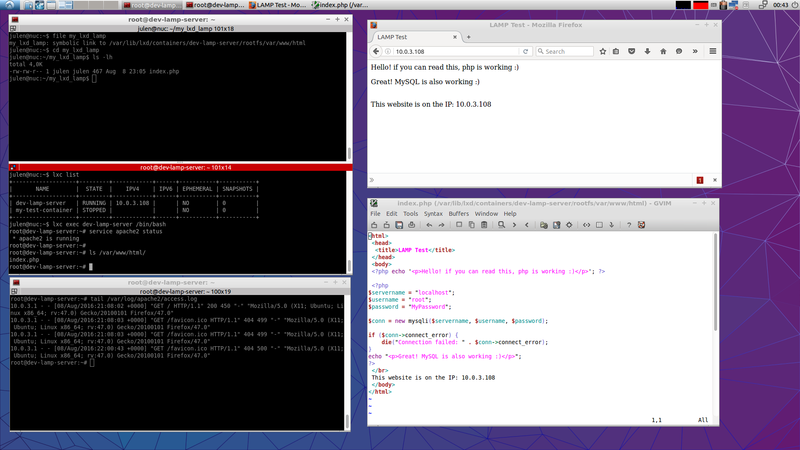 There are plenty of tools for development, but I really wanted to take advantage of LXD for web development, so I ended up writing ll4d: the LXD(LXC)-LAMP environment For Development environment. There are probably better ways to do this, and highly optimized juju charms to build something much better. But for my persona use case, this script is just perfect. It takes just 48 seconds to build everything and it has 100% all the functionality I need. Here is an screenshot of a working environment. You work from a directory directly under your home, access the LAMP server for working with configurations and MySQL databases and access the server on at the given IP. Screenshot of a work environment with ll4d. The few instructions on how to download and exectute it, can be found at the README file. This entry was posted in bash, IT, scripts, System and tagged Containers, Development, LAMP, LXC, LXD on August 9, 2016 by larrucea.